Like many young children, some of my earliest memories were of dinosaurs. 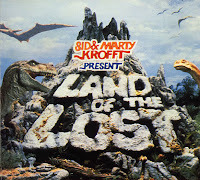 Growing up in the early ’70s, the television series “Land of the Lost” and “The Flintstones” captured my imagination. My fifth birthday party featured a dinosaur cake and pin-the-tail-on-the-brontosaurus. The local library, located mere minutes from my front door, provided me with hours of learning opportunities. I devoured anything and everything that was written about those long-extinct creatures. It didn’t even matter if the material was geared toward children or adults. (I actually preferred the adult books—as long as they had neat pictures in them—because they provided me with so much more information.) The only thing I enjoyed more than correcting my Kindergarten teacher’s pronunciation of dinosaur names was reveling in the mysteries surrounding those “terrible lizards”: Were they cold-blooded or warm-blooded? Did they use their tails for balance or did they drag them on the ground behind them? Was Archaeopteryx really the missing link between birds and dinosaurs? Oddly enough, one of those controversies didn’t faze me, despite my Evangelical upbringing. I was still too young to recognize the contradiction between what I was reading and what my Sunday school class was teaching me. It wasn’t until several years later that I began to ask my parents how to resolve what I understood to be a relatively recent creation of the heavens and earth with what those evolutionists were asking me to accept. Enter Henry Morris . . .
For Christmas, my father gifted me with Morris’ The Genesis Record. Although I was only 9 years old at the time, I devoured Morris’ young-earth creationist tome. Soon afterward, I obtained a free, trial subscription to the Creation Research Society Quarterly journal. Before long, I was a die-hard apologist for young-earth creationism (YEC). Not surprisingly, my classwork soon reflected my new-found paradigm. Although my research paper on dinosaurs provided the reader with the “fact” that dinosaurs were subjected to mass extinction 65 million years ago, I did not pass up the opportunity to footnote that statement with the following: “Of course, we know this not to be true. According to Genesis, God created the world (including dinosaurs!) approximately 6,000 years ago.” I even put a Michigan State University paleontologist on the spot during an interview, hoping to gain an admission that evolutionists were guilty of circular reasoning in their attempt to date rock layers by the fossils they contained, and date fossils by the rock layers in which they were found. By the time I attended college, I had discovered the Institute for Creation Research‘s free, monthly YEC tract Acts & Facts. Morris’ The Biblical Basis for Modern Science and Scientific Creationism were added to my library. They would serve as perfect tools to convert my Catholic evolutionist roommate. I quickly discovered that converting an engineering major wasn’t so easy . . .